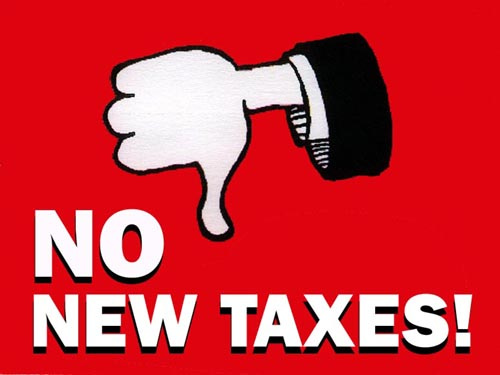 Rep. Brian Stewart Weekly Column: "No New Taxes"
Im sure some of you may find it hard to think about the upcoming veto session with the election season upon us. For me, it is invigorating to serve as your State Representative, and I look forward to addressing hard problems with common sense solutions in November. I believe it will be important for us to come together and work to pave a smooth road for families in Illinois. We have an opportunity to expand beyond the same tired approach that has been dictated in Springfield for almost four decades. As we have discussed in previous columns, Illinois has lagged behind the nation throughout the economic recovery. For such a large and diverse state, the Chicago machines strategy has not made our state an economic powerhouse. When I say Chicago machine, Im not being critical of the city, or its hard working families. To paraphrase President Kennedy, we share common links with families in Chicago. We all share this state. We all breathe the same air. We all cherish our childrens future. So when I reference the Chicago machine, I am talking about a network of politicians and special interests whose mission is not to help families get ahead. Their mission is to advance their own power and privilege. I agree with President Franklin D. Roosevelt, who said, True individual freedom cannot exist without economic security and independence. We need to alter our direction, and make decisions that help working families. We can do this by pursuing policies that will result in balanced budgets, resist tax increases especially on the middle class, and by securing jobs for Illinois families. I voted an enthusiastic No on the last budget. Why? I voted no because years ago, when I was a poor small businessman starting my first business at my kitchen table, I learned to focus on the numbers. When it came time to vote on this years budget, the numbers didnt add up to me. It turns out the budget wasnt balanced to the tune of at least $1.2 billion. Deficit spending and unpaid bills hurt us. They increase our interest rates, push more debt on our kids and grandkids, and stretch tax dollars more thinly than ever before. We need to make smarter spending decisions with the goal of helping families move forward. Treading water is not enough. The Chicago machines answer is the same as its always been. Raise taxes. Some of you remember the first time they played this game. It was during the dead of night in the winter of 2011 when a temporary tax hike was passed. At the time, Illinois bill backlog was $8.5 billion and our pension liability was $83 billion. We were promised the new taxes would pay off our debts. Two years after that increase what happened? Our bill backlog was up $500 million. Our interest payments increased from $53 million to $186 million. Our credit rating was downgraded 5 times. And our pension debt increased by $17 billion. Thats the Chicago machines legacy. These are the people who are spending your money. Last years 32% tax increase has not balanced our budgets. It hasnt paid off our bills. It hasnt improved our credit rating and it has certainly not addressed the pension deficit. Of course, their answer is to raise taxes. But this time there is a new spin. This time, theyre telling us that the taxes will be on the ones who need to pay their fair share. Ironically, the bill they filed in Springfield during the spring session goes a whole lot farther than their spin. Let me explain. The poverty level is roughly $24,000. Median household income in Illinois is roughly $77,000, in Freeport its about $35,500. The progressive tax bill House Bill 3522 raises taxes for people earning between $7,500 and $15,000 by 18%. It increases taxes for people earning between $15,000 and $225,000 by 27%. When they said fair share, I didnt realize it included poor and middle class families. I am also adamantly against a vehicle mileage tax. A mileage tax would hurt Northern Illinois families, farms, and small businesses. Taxes are important. Theyre the price we pay for a civilized society. What concerns me is the lack of responsibility in committing hard earned tax dollars to balance our budget and pay off our bills. Given the Chicago machines legacy, it feels like wed only be throwing good money after bad. In previous columns, we have also established that tax hikes are not the best way to increase revenue, balance our budget, pay off our debt, or secure jobs for working families. Resisting tax increases while finding ways to grow our economy is better at achieving all of those goals rather than forcing families to pay more taxes. I think President Theodore Roosevelt was right when he said, The best prize that life has to offer is the chance to work hard at work worth doing. The primary purpose of growing our economy is to secure jobs. That is why we need common sense solutions to help expand small businesses, agriculture, and agribusiness in Illinois. I look forward to working hard for Northern Illinois during the veto session pursuing common sense solutions to balance our budget, resist tax increases, and help secure jobs for Illinois families. It is work worth doing, and it is a privilege to do it.